Prices for post-consumer PET and natural HDPE have remained flat over the past month. Both are up significantly from this time last year. The national average price of post-consumer PET beverage bottles and jars is currently 15.11 cents per pound. One month ago, this grade was trading comparably at 15.03 cents per pound. One year ago, PET was trading at 13.76 cents per pound. The national average peaked at 17.11 cents per pound in June 2018. 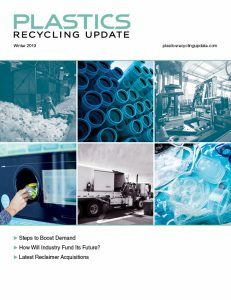 The price of natural high-density polyethylene (HDPE) from curbside collection programs remains constant. The current national average price is 38.88 cents per pound, compared to 38.69 cents this time last month. With the exception of the West Coast and Pacific regions, where the average remains in the 33.00-cents-per-pound range, the national average in all other regions continues in the 42.00-cents-per-pound range. This represents a significant increase over one year ago, when the national average for this grade was 29.97 cents per pound. The national average price of color HDPE went up from 15.09 cents per pound in early January 2018 to the current average of 16.41 cents per pound. The national average price of post-consumer PP is currently 12.50 cents per pound, up from 8.38 cents per pound one year ago. The national average price of all post-consumer film grades remains low compared to one year ago. Grade A film is trading at 8.81 cents per pound, compared with 11.31 cents per pound one year ago. Grade B film is trading at 2.47 cents per pound, compared with 4.06 cents per pound one year ago. Grade C film remains at 1.44 cents per pound.